Hi again Geeklings! Welcome to week 2 of our Month of the Macabre, designed to get you in the spirit of October and celebrate all the spookiness that comes with it. This week, let’s talk about graphic novels, the books that deliver both verbal and visual scares. First, let’s talk Archie Horror. The Archie comics offshoot that started with one title everyone thought was pretty crazy and has since blossomed (get it? Blossom? As in Cheryl?) over the last few years into it’s own publishing line. Taking familiar characters in very unfamiliar settings you can find pretty much anything your horror fan heart could want. Afterlife with Archie, Book 1: Escape from Riverdale by Roberto Aguirre-Sacasa – Some people thought it just wouldn’t work. Take some of the most long-lasting and wholesome characters in all of comicdom, and drop them into a no-holds-barred zombie apocalypse. Well, it happened, and it was a huge hit. Jughead’s dog Hotdog is killed in a hit and run, and he turns to Sabrina Spellman, the resident witch, for help. Going against her aunts wishes, Sabrina uses forbidden and dark magic to raise Hotdog from the dead. But Hotdog doesn’t come back right, and one bite is all it takes for everything to be turned upside down and for the survivors to band together and try to stay alive. Though this was advertised as a parody of horror films it gets downright grim at times. Seriously, it made me cry. But the artwork is gorgeous and it is suitably gory for your Halloween needs. 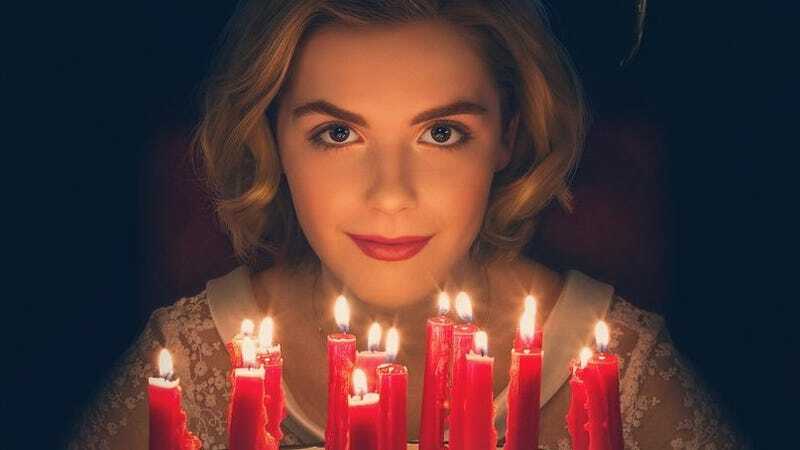 The Chilling Adventures of Sabrina, Book 1: The Crucible by Roberto Aguirre-Sacasa – By far my favorite book of the Archie Horror Line (so far). Going back to Sabrina Spellman, this sets the teen witch’s story in the 1960s. A lot of the same elements are there; Sabrina’s a half-witch being raised by her full witch aunts while maintaining a double life at Greendale High School and dating regular guy Harvey. The main twist in the horror version is that Sabrina’s family are witches because they’ve sold their souls to the devil. And on her 16th birthday (which is also Halloween night) Sabrina must decide if she’ll undergo the dark baptism or live as a mortal. It’s intense and dark but so well-written and intriguing. Plus, Netflix is making a TV series out of it. 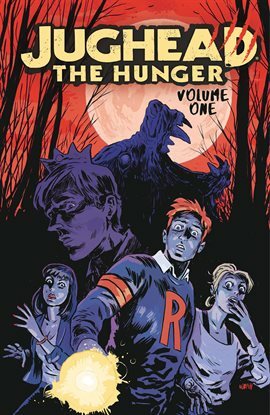 Jughead: The Hunger Vol. 1 by Frank Tieri – Jughead Jones has always been famous for his insatiable appetite. Where does it come from? How about a nice big dose of lycanthropy? Yup, in this universe Jughead is one of a long line of Jones werewolves, and another prominent Riverdale family are also werewolf hunters from just as long of a time back. Looking at how much Jughead can eat in one sitting this makes a lot of sense to me. And the two families locked in combat and with real consequences are just more reasons to read this series. 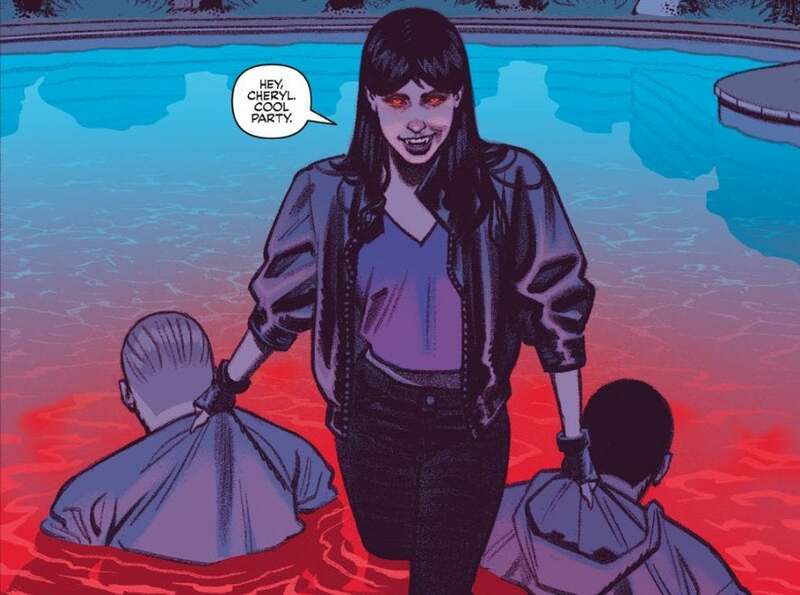 Vampironica Issue 1 by Greg and Megan Smallwood – Veronica Lodge has had pretty simple goals in life. Be rich, be popular, date Archie and sometimes Reggie, and maintain a frenemy status with Betty. Everything changes when she ends up the victim of a vampire attack and she comes back as a blood sucker. How will the change affect Veronica and her goals? Will she be the same old shallow teen or will this make her something more? You’ll have to read to find out. So you’ve got those four series, and there’s more coming. In 2019 Archie Horror will release two new series. One is called Blossoms: 666 and features the Blossom twins, Cheryl and Jason. Still popular and wealthy, but one of them is the Anti-Christ and no one, not even them, knows which one, and both twins want the title. 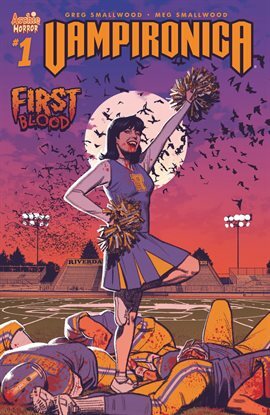 The other series is Jughead: The Hunger vs. Vampironica, which is exactly what it sounds like. In the meantime, you can find more issues of all four of the current series on Hoopla. Anya’s Ghost by Vera Brosgol – Anya’s having a bit of a rough time and could really use a friend. Even a ghost who’s been dead for a century that Anya finds at the bottom of a well seems like as good a friend as any. But, of course, it’s not that simple. Will this ghost be a new best friend or something much darker and more sinister? Gotham Academy, Vol 1: Welcome to Gotham Academy by Becky Cloonan – Set in a school supported by Bruce Wayne (aka Batman; you’ve probably heard of him), Gotham Academy follows Olive Silverlock and her new friend Maps as they navigate regular teen stuff in addition to ghosts haunting the school and old secrets from Gotham’s past being unearthed. Tokyo Ghoul, Volume 1 by Sui Ishida – A series that’s become a classic in horror manga. In this world Ghouls exist, and they look pretty normal but they really really like human flesh. Ken Kaneki is a typical college student until a chance encounter leaves him not quite a Ghoul but not fully human anymore either; something in between, and the first of his kind. Now stuck between two worlds, Ken must learn how the Ghoul society operates if he wants to get a handle on his new powers and survive this new life. Wytches, Volume 1 by Scott Snyder – This story takes witches and makes them about as spooky as you possibly can. Hogwarts students these guys ain’t. Sailor Rook and her family moves to the town of Litchfield NH to escape a family tragedy, and all Sailor wants to do is start over and get settled into her new high school. But there’s something in the woods. Something sinister, and it has other plans for the Rooks. Death Note, Volume 1: Boredom by Tsugumi Oba – Another manga horror classic with some big questions and some Japanese legends to boot. Light Yagami is brilliant but bored. But everything changes when a rogue Shinigami death god leaves the Death Note lying around and Light finds it. It’s a notebook that kills whoever has their name written in it. Light wants to use the Death Note to rid the world of evil but, of course, things get complicated. One of the biggest complications is the Shinigami, named Ryuk, who is pretty darn scary just in appearance alone. So there’s a few to get you started. Any really good ones I missed? Sound off in the comments below. Stay tuned for more scary selections. Have a great week and until next time, End of Line.